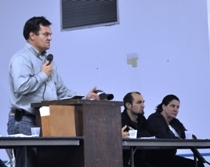 Local 1943 President D. Scott Rich answers questions about contract terms during a ratification meeting, where members voted overwhelmingly to approve the three-year accord. Members of Local 1943 in Middletown, OH, employed by AK Steel ratified a three-year agreement that was set to expire in September of this year. The accord features across-the-board wage increases, increased contributions to the IAM National Pension Fund and more than $3.5 million in contributions to future retiree health insurance premiums. The contract also provides a $1,500 signing bonus for each member and establishes a company-funded, jointly-administered Maintenance Training Program with a full-time Union Training Director.